NIACL Recruitment 2018: The New India Assurance Company Limited, NIACL for short, has released the short notification for NIACL Recruitment 2018. The notification has announced recruitment of NIACL Assistants for 685 posts. NIACL is one of the five government owned insurance companies in India. Interested candidates who want to pursue their career in the insurance sector can apply for this exam. However, they must fulfill the NIACL Assistant eligibility criteria. The online registration for the exam will start on 16th July 2018. In this article, we will provide you with detailed information regarding NIACL Recruitment 2018. Read on to find out. Educational Qualification Candidates must be a graduate in any discipline. Candidates who hold an equivalent degree from a recognized university can also apply. Age Limit Candidates must be a minimum of 18 years old and maximum of 30 years old. However, there is age relaxation for reserved categories as per government norms. The NIACL application form will be made available on 16th July 2018. You can apply for the exam only in the online mode. The online application form will be made available on the NIACL official website – newindia.co.in. Step 1 Go to NIACL official website – newindia.co.in. Step 2 Click on the link for recruitment. Step 3 Click on the link for online registration for NIACL Assistant Recruitment 2018. Step 4 Enter the necessary academic and contact details. Step 5 Upload scanned image of your photograph and signature in the right format and dimension. Step 6 Make payment of NIACL application fee. Step 7 Check if you have entered everything correctly ad submit. Step 8 Take a printout of the online application form for future reference. The NIACL Preliminary exam is of one hour duration. The three different sections are not separately timed. The Main exam is of 2 hours duration. As you can see, the NIACL exam pattern for Prelims and Mains is almost similar to the exam pattern of banking exams, like SBI PO, SBI Clerk, IBPS PO, IBPS Clerk, etc., taking bank mock tests will be definitely help in your preparation. The NIACL admit card / NIACL hall ticket will be released on the official website. Candidates will be login to their account in order to download their admit card. The pay scale for NIACL Assistant Cadre III is Rs. 14,435 to 40,080. 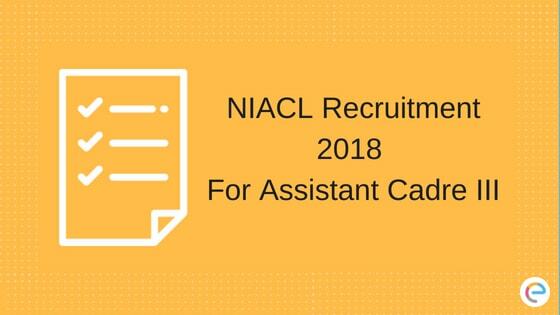 Now that you know everything about NIACL Assistant Cadre III Recruitment 2018, start your preparation for the exam. You can take bank mock tests on Embibe for free and this will prepare you to face the NIACL Assistant exam 2018. We hope this detailed article on NIACL Recruitment 2018 helps you. If you have any query regarding NIACL 2018 Recruitment, feel free to contact us. We will definitely help you out.